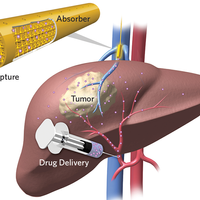 The proteasome can be divided into two main components: the core particle, four stacked rings that form the proteasome’s barrel structure, and the regulatory particles that form “lids” on either end of the barrel. At the junction of the lids and bases of the regulatory particles is Rpn10, which binds the polyubiquitins on targeted proteins. Other subunits in the regulatory particle release the ubiquitin and help unfold the proteins. Inside the core particle, the proteolytic β rings, each of which have seven subunits, degrade the protein chain into short peptides of just 3 to 15 amino acids. 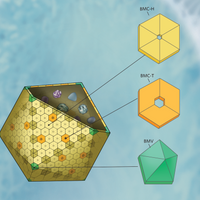 Proteasomes cut the carboxyl side of basic, acidic, and bulky hydrophobic amino acids.THE SCIENTIST STAFFIn contrast to cellular proteases, which cleave proteins at specific sequences, the proteasome hydrolyzes targeted proteins at certain types of individual amino acids. 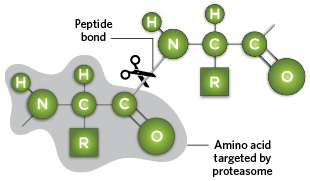 Threonine residues in three separate β subunits of the core particle attack the peptide bond of its target amino acid (colored arrows). Shown here is the amino acid sequence of DNA-dependent protein kinase (DNA-PK). The cellular protease granzyme B cleaves DNA-PK only following its consensus sequence (italics; black arrow), which exists only twice in the entire protein, while the proteasome cleaves DNA-PK hundreds of times over its length (colored arrows). 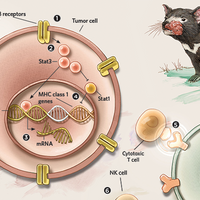 Researchers have developed a variety of ways to send target proteins to the proteasome for degradation. 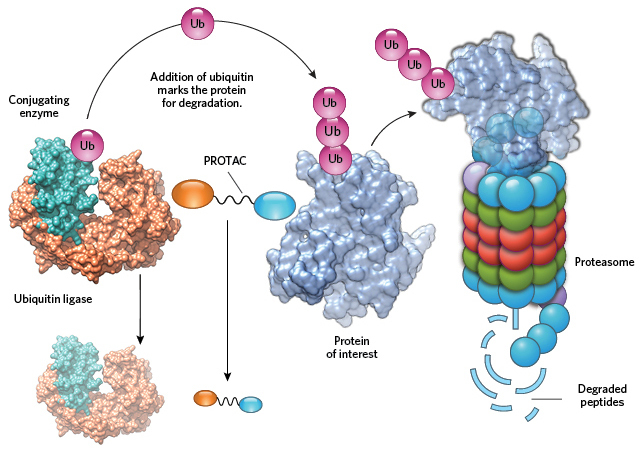 PROTACs help catalyze the ubiquitination of target proteins. 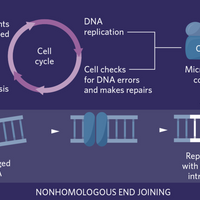 PROTACs require only brief contact to trigger ubiquitination, meaning that one PROTAC molecule can flag multiple copies of its target for disposal. 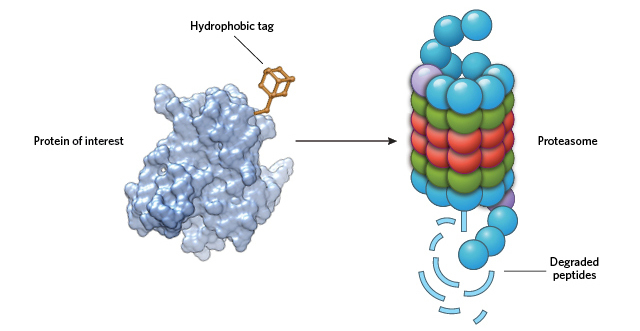 By adding a large hydrophobic moiety to a target protein’s surface, HyTs cause the cell to see the protein as unfolded. This activates chaperone proteins in the cell to direct the “unfolded” protein to the proteasome for degradation.